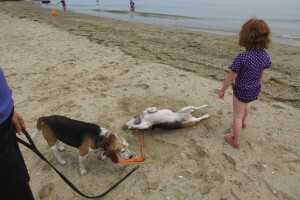 The good people of Plymouth, MA, are too pre-occupied promoting their Pilgrim amusements and adorable downtown to notice they’ve got something unique in the northeast: beaches where people can bring their dogs–even during the days of summer. In all of these places I imagine some horrible town council dominated by one or two people–cat people, probably– who are both dog-hating and power-loving. The smaller the jurisdiction, the more likely they are to have some hateful and capricious dog ban–and lots of other rules. The broader the government body, the less likely they are to ban dogs. So, tiny, useless town parks (like in Irvington, NY) ban dogs, but many federal beaches on Cape Cod or Fire Island are immune to this kind of political grandstanding. Are they worried about dog waste? Then that’s a separate law. And as a mom to a human child, I found a recent sign in Maine’s Range Pond State Park chastising people that even dog poop buried in the woods was a threat to our children a bit of a stretch. Or are they concerned dogs will run into people? Then why not ban sports? Oh, wait, some have even done that, too. What these towns don’t seem to consider is that families go to great lengths to travel with dogs, so a tiny accommodation would be a huge attraction. 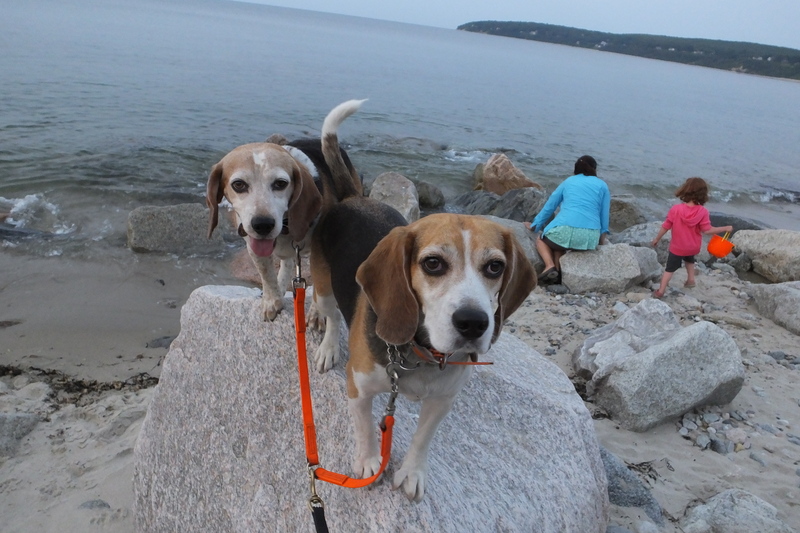 My family was driving back from Maine to New York and looked online for a dog-friendly beach town. New England Dog Travel pointed us to Plymouth. We found (at least) two dog friendly beaches. Long Beach allows dogs in summer just at one end and on a leash. There’s free parking, trash cans, and a bar nearby. Beagle down! Moxie loves the beach so much she runs in big circles, rolls in sand and tries to eat shells. The real gem, though, was Nelson Memorial Park, maybe the best beach for dogs, kids, and birders in New England. The woman at the visitor’s center sent me there after I said we came to town for the dog-friendly beaches. “Oh, you must have been disappointed then to find out they have to be on leash,” she said modestly. No! That’s totally fine. We have two former research laboratory beagles; you’ve seen videos of beagles like them shocked to be on grass or sunlight for the first time. That’s what they were like when we got them. Moxie, who spent two years in a lab, wouldn’t walk down the street without cowering. Then we took her to a beach, months later, and she went bananas. She ran in huge circles. She ate sand. She chewed shells. 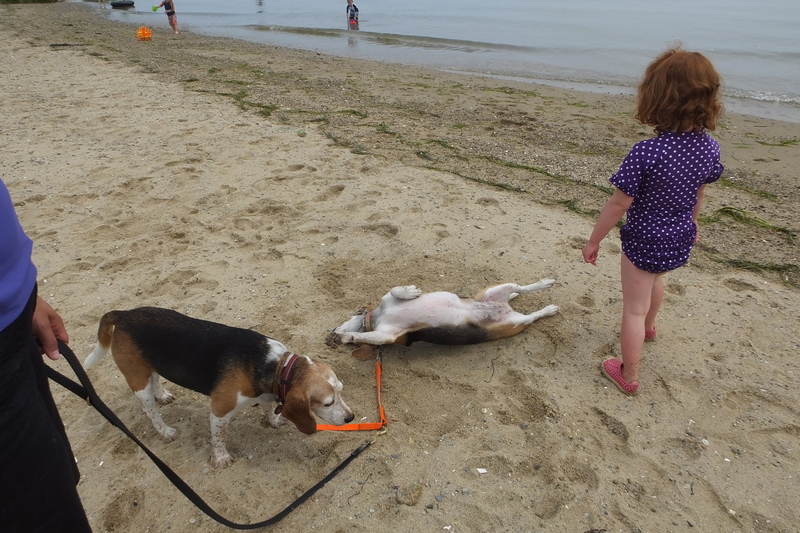 She rolled on the sand in excitement. So, I feel morally obligated to take her to a beach whenever I can. She doesn’t go in the water or bark. Because of the leash law, she couldn’t run in huge circles. But she still was just so happy it was worth spending a night in Plymouth. 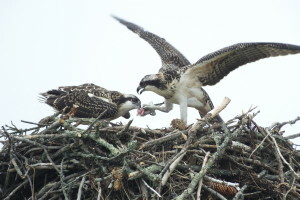 Nelson Memorial Park has everything you could want, including an unbelievably close Osprey nest. Here’s how amazing Nelson Memorial Park is: You can buy food at a stand, wear your kids out on the playground, cool them down in the splash pad, and then amble along the long beach and its gentle, shallow water. The beach featured all kinds of shells, and it’s the only place I saw people playing with their kids in the water, even in the reeds. There’s also some kind of spring that makes a warm water tidal pool, where toddlers plopped. Unbelievably, within 20 feet of the beach is an osprey nest on a pole, close enough that we could see two chicks playing tug of war with a fish. Plymouth seems like it might be the only town in America that just didn’t order their beach rules sign off a template. In fact, I never found a beach rules sign. Even their wording of the announcement of limited dog rules makes it seem like the Fish and Wildlife Service made them do it to protect plovers, not just people who hate dogs. For a while we were the only people with a dog. I started to worry I’d gotten the rules wrong. When another woman with a dog came along I sheepishly said how much I loved the dog-friendly beaches, hoping to get some confirmation. She said she was from Plymouth and didn’t think it was anything special. I explained how rare it was all the places we’d seen. “That’s so weird,” she said. “Because walking on the beach with your dog is such a New England thing to do.” I know, right?